Perhaps more than any other sport, lacrosse has become something more than just a game. For many lacrosse players around the country, they look at lacrosse as a part of a distinct lifestyle associated with the sport. People may disagree about what exactly constitutes this lifestyle, but you would be hard-pressed to find a lacrosse player who doesn’t acknowledge the importance of flair within the sport, both on the field and off. This emphasis on style points is what makes choosing team lacrosse uniforms such a significant decision, whether your goal is to impress high school athletes or to aid your college recruiting efforts. 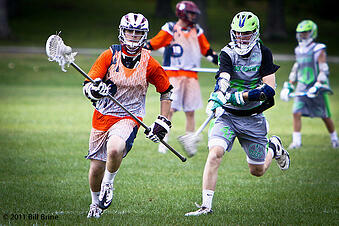 It’s also why more and more teams are choosing to use sublimated lax jerseys. Sublimation is a form of uniform design that involves dyeing colors, logos, and names into the fabric of jerseys. For fully customized orders, each section is dyed individually and subsequently sewn together, a method known as “cut and sew.” This technique replaces the traditional stitching model that has been used for decades. While traditional screen printing is not necessarily low-quality, people often complain about the wear and tear of this kind of customization (ink fading, numbers cracking, etc). Moreover, printed jerseys limit creativity. Sublimation allow for more customization than any other form of uniform design. Even though high school teams have to remain NFHS compliant and abide by certain uniform constraints, many of these squads still choose limited sublimation, where only certain panels or sections of the jerseys are dyed. Sublimation is also extremely popular with college varsity and club lacrosse teams, which often have more money to spend on customizing every inch of their jerseys, also known as full sublimation. With sublimation, there are no restrictions on the colors, size, or complexity of your team’s design. Sublimated lax jerseys are typically printed on “performance” moisture-management fabric, a lightweight, high-quality material that allows players to feel faster and more flexible. Unlike many traditional uniforms, sublimated jerseys are long-lasting because the printed numbers, names, and logos don’t peel, fade, or fall off. They should be washed in cold cycles in order to maximize their durability. How Much Do Sublimated Lacrosse Jerseys Cost? It’s important to note that sublimated lacrosse jerseys aren’t for everybody: They’re more expensive than the average stock lax jersey (roughly $50, whereas Under Armour sublimated jerseys are approximately $90) and the turnaround time is much longer, usually taking 2-4 weeks longer to receive than stock jerseys. Under Armour, Turfer, Reversible Lifestyles, and Adidas all make high-quality sublimated lacrosse jerseys, if you can afford them. Schools on tight budgets should still consider ordering sublimated lacrosse jerseys as long as they’re willing to purchase reversible sublimated jerseys as a means to reduce costs. Consulting with a team dealer can help you figure out what the best option is for your school both financially and stylistically; team dealers have graphics designers to help you think of jersey ideas, and they offer volume discounts for bulk orders. Sublimated lacrosse jerseys are the future of lacrosse style, which is to say that they’re an integral part of the sport’s future. Thus, using a team dealer as a resource to determine whether this uniform design is feasible for your school is a no-brainer.